An enormous decorated Christmas tree stands in the lobby of the Hyatt Bellevue, Toy Solders line the streets, and lights, so many lights decorate Bellevue Square at Snowflake Lane in Bellevue Washington. Oh, and did I mention the parade to kick off the holidays and the nightly entertainment! Where else can you get snow on a nightly basis when you visit the Pacific Northwest unless you are atop Mount Baker. Bellevue takes many people’s favourite time of the year and does it right! Holiday events at Bellevue Square include Santa Photos, evening performances on Snowflake Lane, Holiday Entertainment at Bellevue Square Centre Court, and a salute to New Years on Celebration Lane. Where to find Snowflake Lane? Snowflake Lane in Bellevue is location between Bellevue Square, Bellevue Place and Lincoln Square. Every night the streets fill with drummers and dancers, music and SNOW! The kids loved the parade to kick off the festivities! Bellevue knows how to throw a Christmas celebration for the whole family! The parade kicks off the festivities on Black Friday every year! This was our first year visiting, we checked into the Hyatt Bellevue, spent an hour at the pool and then bundled up for the parade! The kids loved it! We enjoyed hot chocolate and cookies while we waited for photos with Santa, Frosty and the magical snow characters from the parade! KidsQuest Museum helps kick off the festivities with Gingerbread Workshops! Make sure you register for these in advance, as they can sell out! It is $50 for a family of up to 6 people. While you might think, wow, thats pricey (that was my first thought), once you get inside, the gingerbread house is already assembled for you and there are ENDLESS decorations and icing! The Icing fairy is happy to provide more icing and the buffet style candy bar is enormous! I would have spent almost that much money trying to put together something like this for my kids! We will be sure to be back next year! We found several families who each had their own house and some of their creations were amazing! I wish they did this every weekend, but it only happens on opening weekend! The Bellevue Botanical Garden puts on an stunning light display with over half a millions lights! It is open from Black Friday until Dec 31st and costs $5 for those over 10 years old. Children under 10 are free. What we loved in Bellevue Washington? We loved dinner at Maggiano’s Little Italy! So much that we went back the next day! The kids meals are under $6 and the portions are huge! Mattias was all over the cheese pizza and Markus devoured about half of the mac and cheese! Maggiano’s has a really cool menu where you can order one portion to eat, and they bring you out a second portion to take home! And it was less than $14! The Snowflake Lane nightly entertainment is worth waiting around for! Whether you are in Bellevue to shop, to relax or to celebrate, work your schedule around the nightly performance! Especially if you have kids! Where to Stay in Bellevue? We chose to stay at the Hyatt Regency Bellevue for the convenience of the location! The evening entertainment was right outside, Santa at the mall is across one of the raised walkways and breakfast with the Hyatt Regency Club was included. Rather than spend extra money on breakfast that who knows if the kids are going to eat, the Regency club had hot and cold eats to pick from! Check out the pricing to stay in a Regency Club room as it might make more sense than order breakfast in the hotel or elsewhere! They also have evening hors d’oeuvres. We did not have to move the car to get something to eat or to hit the mall, we didn’t even need umbrella’s because of Bellevue’s covered walkways! The Hyatt has a nice pool which Mattias who is 5 could touch the bottom. It is a lap pool and the same depth the whole length. Its nice for little ones who are not quite swimming as we did not have to worry about him getting in over his head! They had lots of pool toys to use and ping pong on the pool deck as well as a nice gym! When traveling with a family, their suites check everything off out Hotel Musts list, they offer plenty of space with the one bedroom option. Once you have stayed in a suite, you never want to go back to a regular hotel room! We will definitely be adding Bellevue to our Weekend Trips from Vancouver List! While Seattle is a big draw, Bellevue should be included in weekend plans too! 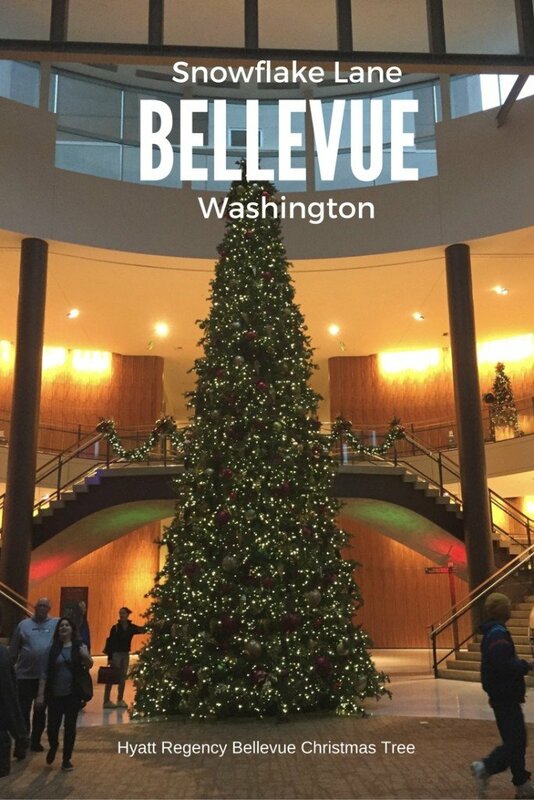 Whether you want good eats, good shopping or lots to do with the kids, we had a great weekend in Bellevue and will be back soon! You can hover over this pinnable image (or any image on my site) on Christmas in Bellevue Washington to quickly pin it !